Description: By the sea, this former fishing district and workers is now a popular and picturesque houses an intense day and night life. A few steps from the beach and 20 minutes walk from Las Ramblas. We like: walking along its narrow streets and feel like a village, discover its typical façade, go for tapas bars in its small not very expensive, eating paella by the sea in its beach bars, do rollerblade on the promenade by the sea, go take a trip to the beach after dinner and a night out in his music bars and nightclubs. Transport: Metro L4, several bus lines, commuter trains and long distance (Estacion de Franca), Bicing, night buses. Amenities: Market district (Barceloneta), shopping (Mare Magnum), IMAX theater, gyms, supermarkets. Ideal for: young professionals or students. Avoid it if you want peace, Barceloneta neighborhood is quite noisy, with its bars, outdoor restaurants and tourist groups. Description: Born in the historic district is a centuries-old charm. In the heart of the city but less raced tourists, it is also appreciated for its cultural and very fashion boutiques. We love: to walk around in its pedestrian streets in the footsteps of the hero of “The Cathedral of the Sea” dinner on the Passeig del Born, take a breath of fresh air and listen to impromptu concerts in Parc de la Ciutadella, stroll through Unique shops and original, go see the new exhibits and art galleries or the Picasso Museum, watching the bride and groom leave the beautiful basilica of Santa Maria del Mar. Transport: Metro L4 and L1, several bus lines, commuter trains and long distance (Estacion de Franca), Bicing, night buses. Amenities: neighborhood markets (mercado del Born and Santa Caterina), gyms, supermarkets. Ideal for: those who like to live downtown. Avoid the nearest part of the sea if you want peace. Some streets may be poorly attended in the most north to Arc de Triomf. Description: The Gotic is a medieval area, between Las Ramblas and the Born. Nerve center of the city, this is one of the most tourist. We love: have a coffee in the Plaza Real, or one of its many places of nature, discover its many historic sites, stroll through the Jewish Quarter, dancing sardanes on Cathedral Square, discover its many cafes and restaurants, shopping street Portal del Angel and Calle Avinyo, meet all nationalities, attend openings its countless art galleries. Transport: Metro L3, L4 and L1, several city bus lines and commuter passenger plane, commuter trains and long distance (Plaza Catalunya with Rodalies Renfe and FGC), Bicing, night buses. Amenities: the market’s most famous city (La Boqueria), supermarkets, sports halls. Ideal for: young revelers. The Gotic has the most vibrant nightlife in the city, every day of the week. Description: neighborhood in the city center, the Raval has a bad reputation but there are artistic and architectural wonders. We love: a drink on the terrace on Rambla del Raval, watch the skaters perform tricks on the place of MACBA, discover its many cafes and cheap restaurants and arty, cross all nationalities in the world, participate in festivals CBAC, strolling through vintage shops. Transport: Metro L3, L2 and L1, several city bus lines and commuter passenger plane, commuter trains and long distance (Plaza Catalunya with Rodalies Renfe and FGC), Bicing, night buses. Amenities: two of the most famous market in Barcelona (La Boqueria and Sant Antoni), supermarkets, theaters. Ideal for: artists and open-minded. The Raval is a central, typical and authentic, with a large thriving arts scene. Some of its streets are dirty and poorly attended, however. Description: San Antonio marks the border between the Old Town and Eixample. This is a modern, dynamic and very well located in central Barcelona. We like: find frippes and fresh produce market in San Antonio, go see a movie in its original version in theaters, on Sunday stroll on the old book market, you can have a cafe con leche on the pedestrian street of the Mistral, doing business in its many computer stores and outlets of major brands of ready-to-wear. Transport: Metro L1, L2, L3, several city bus lines and commuter Bicing, night buses and 15 minutes from Plaza Catalunya (Rodalies Renfe suburban trains, FGC and Aerobus). Amenities: neighborhood market (Sant Antoni), supermarkets, cinemas. Ideal for: those who like to have everything nearby. Sant Antoni is a central district, close to everything and has a range of services, shops, restaurants and great cultural offerings. Description: Built in the late nineteenth century to enlarge the city of Barcelona, ​​the Eixample esquerra (extension, left) is now a recreation area dynamic and trendy, home to many Catalan families. We like: stroll through its streets and stumble upon a modernist building, shopping in Rambla Catalunya, browse art galleries, dinner on one of the many outdoor restaurants Enric Granados street, out until in the early morning gayxample (gay nightlife area). Transport: Metro L1, L3 and L5, several city bus lines, Bicing, night buses, commuter trains FGC (Provenza station) and close to Plaza Catalunya (Rodalies Renfe suburban trains, FGC and Aerobus). Amenities: neighborhood market (Ninot), supermarkets, cinemas, shopping center (Arenas), sports halls. Ideal for: urban families, working people, retirees. The eixample esquerra is a nice area for all, with pedestrian areas, with many local services, good transport links, and little tourism. Description: Built in the late nineteenth century to enlarge the city of Barcelona, ​​the Eixample dreta (extension, right side) is a family neighborhood and urban parks and aerated with pedestrian areas. We like: take a break in the park without the Sagrada Familia but admire the cathedral, have a coffee on Avenida Gaudi pedestrian, marvel at the Hospital Sant Pau and the countless modernist facades, blazing in the boutiques of Paseo de Gracia. Transport: Metro L1, L2, L3, L4 and L5, several city bus lines, Bicing, night buses. Amenities: neighborhood markets (la Concepción, Fort Pienc and Sagrada Familia), supermarkets, cinemas, theaters, sports halls. Ideal for: active, urban families, retirees. The eixample dreta is a central, clean, pleasant, with many local services. A fascinating area, not too overrun with tourists. Description: District artistic and activist par excellence, a former independent municipality, Gracia has kept the soul of a village, with its squares and bars where cause and we are constantly remaking the world. We like: you can have a coffee in the sun at any time of the year on the popular Plaza del Sol, will stroll through quaint shops, spend hours in its many small bookstores, eat outside on the lovely Plaza de la Virreina, not sleep for a week to enjoy the block party in August, out any day of the year and find people in bars and restaurants, go see a movie at VO in the street Verdi. Transport: Metro L3 and L4, several city bus lines, Bicing, night buses, trains banlieur FGC (Gracia station). Amenities: neighborhood markets (Abaceria, The estrella, the Llibertat, Lesseps), supermarkets, cinemas, theaters, sports halls. Ideal for: all generations, to bohemian trend. Gracia is a colorful neighborhood, home to be safe in a good mood and retirees, young couples, families, artists, students and anti-globalization. Description: eccentric, quiet neighborhood, Horta-Guinardo often looks like a village, it was also before its attachment to Barcelona. A typical Catalan neighborhood. We love: spend Sunday afternoon in the park or the Labyrinth Park Guell overlooking the city, enjoy the views of Tibidabo and its greenery, to walk around on foot in its many gardens, while paying much less that downtown, a game of tennis on the side of Vall d’Hebron, participate in discussions of great grannies neighborhood. Transport: Metro L3, L4 and L5, several city bus lines, Bicing, night buses. Amenities: neighborhood markets (El Carmel, Horta, El Guinardo, Vall d’Hebron), supermarkets, cinemas, gyms, sports fields. Ideal for: families, retirees and those seeking tranquility and authenticity. Neighbors know here often for several generations and will welcome you with open arms. Description: Very close to that of the Sagrada Familia, Clot is a residential area and well connected with many shopping areas. Transport: Metro L1, L2 and L5, several city bus lines, Bicing, night buses, commuter rail, airport and regional train (station Clot). Amenities: neighborhood market (el Clot), supermarkets, gyms, shopping center (Glories). Ideal for: those who want a bigger house and cheaper, in a quiet and easily accessible. Clot is a very well served by public transport, a short drive away and has many services and shopping centers. Description: As its name suggests, Vila Olimpica is actually designed the Olympic Village to house athletes in 1992. It is now a residential area, just steps from the beach. Transport: Metro L4, tram, several city bus lines, Bicing, night buses. Ideal for: those who like new! Vila Olimpica is the district’s newest and Barcelona is home to some very nice apartments, all equipped in residences, including some with pools. We like: stroll through its streets and fall on an old factory chimney that has been kept as a souvenir, lunch on the Rambla de Poblenou, sunbathe on the beaches less touristy and cleaner than in the center, watching them build the design buildings most of the city in the Distrito 22 @ shopping at the mall Diagonal Mar, to walk around in the large neighborhood park, take advantage of its excellent bars and restaurants. Amenities: neighborhood market (Poblenou), supermarkets, sports halls, cinemas, shopping center (Diagonal Mar). Description: These two ancient villages attached to Barcelona to become a neighborhood full welcome the Catalan bourgeoisie more than a century.This is one of the most exclusive areas of the city, also known to be among the most expensive in Spain. We love: enjoy its many gardens, be close to the park Collserola also take trips and Tibidabo to admire the view, make discoveries at the museum CosmoCaixa, getting lost in the small streets around the Major de Sarria, visit the most beautiful modernist homes, Catalan dinner in fine restaurants. Transportation: commuter train (FGC, which connect to Plaza Catalunya), several lines of buses, trams, Bicing, night buses. Amenities: neighborhood markets (Sant Gervasi, Galvany, las Tres Torres, Sarria), supermarkets, sports halls, cinemas, shopping centers (Illa Diagonal, Pedralbes Center, Corte Inglés). Ideal for: families, active, seeking comfort, tranquility and greenery. Sarriá-Sant Gervasi offers many possibilities: streets and old buildings or new developments, but always of high standard and with many local services. Description: outlying districts, popular, working-class tradition, Sant Andreu and Nou Barris areas are lively and colorful. We love: sipping a soda on the Rambla Fabra i Puig, shopping in the boutiques of the shopping center to open “the Maquinista”, delicious dinner in cheap restaurants, attend all the festivities of the neighborhood, having neighbors from all continents. Transport: Metro L1, L3, L4 and L5, several city bus lines, Bicing, night buses, commuter trains and airport (RENFE station Sant Andreu). 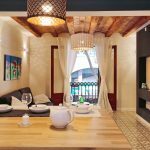 Amenities: neighborhood markets (Sant Andreu, el Bon Pastor, Canyelles, the Merced, the Guineueta, Montserrat, Trinitat, Nuria), supermarkets, sports halls, cinemas, shopping center (the Maquinista). Ideal for students, young professionals, families, seeking a vibrant, living and typical, as well as housing and services cheaper. Description: residential area, close to the sea and the historic center, Sant Marti has undergone major transformations in the years during which 60 were built of large groups of buildings to accommodate the new migrants from all over Spain. We like: jogging in the park district, to be a few metro stops from the largest shopping malls and the beach, take a break in the pleasant garden of the church of Sant Marti Provençals and stroll through the narrow streets adjacent pedestrian. Transport: Metro L2 and L4, several city bus lines, Bicing, night buses. Amenities: neighborhood markets (Sant Marti, el Besos), supermarkets, gyms, shopping center (Diagonal Mar). Ideal for: pensioners, families, active seeking tranquility and convenience. Sant Marti is a homogeneous neighborhood, quiet, easily accessible by car, with parking and all necessary local services. Description: Sants is a bustling shopping district, the Catalan assertive personality and good location. We love: being ten minutes from the beautiful Plaza de Espanya, lunch on the terrace shaded in Catalan restaurants not very expensive, walk to the Camp Nou to watch Barca matches, shopping on the Calle de Sants, take the air at the Espanya Industrial Park, participate in the famous neighborhood celebrations in August. Transport: Metro L1, L3 and L5, several city bus lines, Bicing, night buses, commuter trains, regional, long distance and TGV (Sants station). Amenities: neighborhood markets (Hostafrancs, Sants), supermarkets, sports halls, cinemas, shopping center (Las Arenas). Ideal for: families, active students. Sants is an urban neighborhood, Catalan, a lively and festive area, just behind the tourist circuit. Description: upscale neighborhood close to the Camp Nou and the lively neighborhood of Sants. We like: having a choice of shopping centers, live near Camp Nou, living in town but quiet and green, lunch in one of the many cafeterias and restaurants area. Transport: Metro L3, several lines of buses, trams, Bicing, night buses. Amenities: neighborhood market (Les Corts), supermarkets, sports halls, cinemas, shopping centers (Illa Diagonal, Pedralbes Center, Corte Inglés). Ideal for: families, retirees, students. Located in the heart of a university, the Corts are a lively during the day and quiet at night. It is also one of the safest areas of the city. Description: privileged area, Pedralbes home to many parks, town houses and residential high-end. We like: crossing the celebrities who live in the district (several Barca players, Shakira, etc. ), discover its historic parks and gardens, explore the wonders of modernism, enjoy the swimming pool of the residence, shopping in malls nearby. Transport: Metro L3, several city bus lines, tram, night bus. Amenities: supermarkets, gyms, shopping centers (Illa Diagonal, Pedralbes Center, Corte Inglés). Ideal for: High and middle class. Pedralbes is an upscale, safe, home to beautiful apartments and residences all equipped. Description: Poble Sec is ideally located between the port of Barcelona, ​​Montjuic and the historic center. A neighborhood near the Raval and its nightlife, but quiet at night: the advantages of the inner city without the disadvantages. We love: enjoy the view of Montjuic and the sea, a drink in a picturesque neighborhood bar or terrace plaza Sortidor, be spoiled for choice between a cabaret show, a play or concert in one of its many rooms, tour the tapas bars most famous of the city, being ten minutes from most tourist sites and cultural city. Transport: Metro L2 and L3, several city bus lines, Bicing, night buses. Amenities: supermarkets, sports halls, cinemas, theaters, shopping center (Arenas). Ideal for students, young professionals, urban families who like to go out. 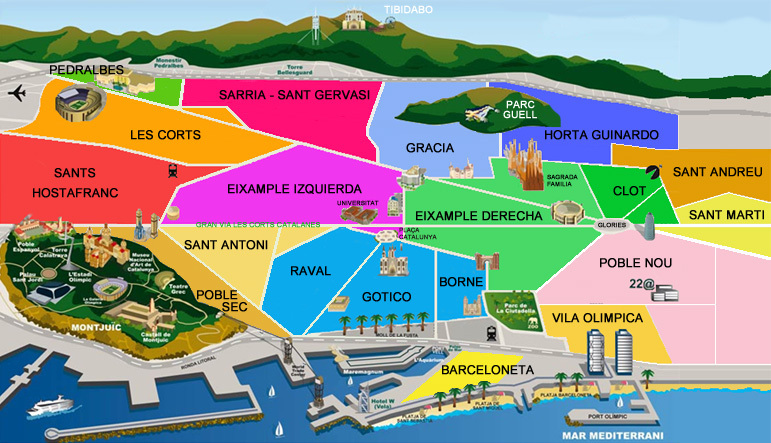 Montjuic-Poble Sec is a safe, pleasant and enjoying a great cultural offerings. It is also close to the many nightlife Gotic and Raval.